Home > Dog's Nature > Which Dogs Need Muzzling? A muzzle is used when a dog is thought to be a danger to humans and or other dogs. A dog should not be put in a muzzle as part of its daily routine as many types of muzzle will not allow a dog to eat or drink. Muzzles also stop a dog from defending itself. There is usually no such thing as a bad dog; normally it is a bad owner who is incapable of training and controlling a dog. If a dog is a danger to others you should seek help, a muzzle alone will not solve the problem of the dog’s aggression. Speak to your vet who can put you in touch with a reliable trainer who may be able to help. A canine behaviourist may also be able to help you and the dog. Don’t be tempted to take risks with a dog, even though he is muzzled he can still cause damage with his body. A frail person or a child can be injured and frightened by the aggressive dog even though it cannot bite. The Dangerous dogs Act of 1991 pinpointed a few breeds that were considered to be a danger to the public. These breeds were; the Pit Bull Terrier, the Japanese Tosa, Fila Brasileira and the Dogo Argentinos. Furthermore no person would be allowed to breed from these breeds of dogs, sell or exchange or gift them. Also the owners were not allowed to abandon the dogs and to have them on a lead and muzzled at all times when out in public places. Technically these breeds should by now have died out naturally but we still hear of fighting dogs attacking people and being bred for fighting. It is generally acknowledged that implementation of the law has simply driven the fighting dogs and their breeders underground. Attending training classes when the puppy is first purchased can alleviate problems when the dog gets older. It is your duty to socialise the puppy and make him a good member of our society. Placing a muzzle on a dog will not stop him barking. If a dog barks when left alone it is because of separation distress and the owner would need to seek the assistance of a behaviourist. A dog should never be left alone with children under any circumstances. 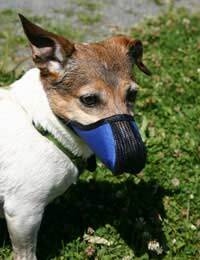 Even if a dog is muzzled it can still do harm. Some breeds and types of dog such as the Greyhound and the Lurcher are bred to chase small animals. It’s in their nature and even living within a home environment they will naturally revert to their breed type when they get the scent of their prey. Therefore it is commonplace to see these breeds being muzzled whilst out walking. These dogs are naturally affable characters but it is more for the safety of their prey that they wear a muzzle. Before resorting to the use of a muzzle on your dog consider seeking advice from canine professionals who can advise on all aspects of training that may help your dog. My 91 yr old father has 'rescued'a lurcher from the dogs trust.She is 9 years old they think seems very placid and iscompany for him.Shoukd she be muzzled when he takes her out for a walk?